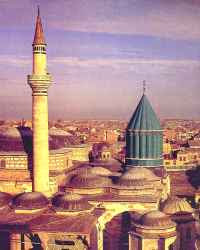 The earthly remains of Rumi lie buried at the crossroads of the East and the West, marked by a green dome of rather unusual shape and surrounded by the compound that used to house a monastery of dervishes until pressures of modern age forced the order to be disbanded. Graves of Rumi's family and disciples still surround the tomb, but at least one of them is empty. The person named on the tombstone was born some six centuries after the death of the master, was not even remotely related by blood and never visited Turkey. He was Dr. Sir Muhammad Iqbal (1877-1938), the Poet-Philosopher who proposed and predicted the birth of Pakistan seventeen years before the historic event. The actual grave of Iqbal in Lahore, but in the heart of the Muslim world he remains inseparable from Rumi. This matter of the heart stands revealed at the doorstep of the master. In the Muslim world, Rumi is revered more than any other wordsmith: his Divan of Shams Tabriz remains unmatched for inducing magnificent ecstasy (and is the source of most of those “love poems” of his that are becoming popular in the West), while his Masnavi (a long poem of rhymed couplets) has been described as “the Quran in Persian" (the famous epithet is from Abdul Rahman Jami, one of the greatest Persian poets and literary critics). Just like Rumi’s Divan, the poems of Iqbal also combine unusual depth with immense appeal for everyone, and just like the Masnavi of Rumi, they were claimed to contain nothing “other than the Quran.” Despite this, while Rumi is the highest note in Sufi poetry, Iqbal can easily be described as the highest in political, since he is the only poet in history to be credited with inspiring the birth of a new state. In the eyes of the world, no two poets could be more distanced from each other, but the transfer of power from the king to Rumi, allegorically described at the beginning of the previous chapter, seems to have started happening although it still awaits complete understanding. The symbolic grave of Iqbal at Konya is a subtle reminder. Thank you for this,it is very enlightening.